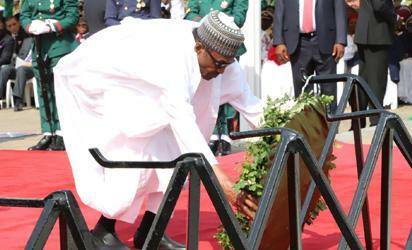 ABUJA— President Muhammadu Buhari and Vice President Yemi Osinbajo, yesterday, led service chiefs, other top government functionaries and members of the diplomatic corps to lay wreaths in honour of those that died in service in Nigeria and at international assignments. This came as the Nigerian Army said it has released 244 repentant Boko Haram terrorists to the Borno State government. Also, some state governors called for prayers for families of those who died in active duties. This was part of activities marking the 2018 Armed Forces Remembrance Day celebration, which culminated in the laying of wreaths at the National Military Cenotaph, Abuja. Aside the president and his vice, other personalities present at the wreath laying ceremony were Senate President, Dr Bukola Saraki; Speaker, House of Representatives, Yakubu Dogara and Chief Justice of Nigeria, CJN, Justice Walter Onnoghen. Others were the Chief of Defence Staff, General Gabriel Olonisakin and the Service Chiefs— Chief of Army Staff, Lt General Tukur Buratai, Chief of Air Staff, Air Marshal Sadique Abubakar and Chief of Naval Staff, Vice Admiral Ibok Ete-Ibas. The ceremony, which holds on January 15 of every year, at National Memorial Arcade in Abuja, is also dedicated to appreciating surviving military men who have retired from active service. Meanwhile, the Nigerian Army has released 244 repentant Boko Haram terrorists. Those released include, 56 female, 118 male adult, 19 under aged and 51 children, which the army said have undergone the de-radicalization process. Receiving the repentant insurgents, Governor Kashim Shettima commended the Nigerian Army for releasing the repentant Boko Haram insurgents and advised them to be of good behaviour. President of the Senate, Dr. Abubakar Bukola Saraki, has called on the Federal Government and military authorities to prioritize the welfare of both their serving and retired personnel; in view of the enormous sacrifices they render to sustain the peace and security of the country. Marking the Remembrance Day, Governor Simon Lalong of Plateau State encouraged families of fallen heroes and those alive not to think that their sacrifices to the nation is in vain as they did what they did to restore peace in the nation. On his part, Governor Rochas Okorocha of Imo State said Nigeria was passing through difficulties of terrorism and evil herdsmen. Okorocha, in a statement by his Chief Press Secretary, Mr. Sam Onwuemeodo said: “Nigeria today is passing through a very difficult time. We are having so many challenges, ranging from terrorism to activities of the evil herdsmen and those who have chosen to kill for no just reason. Canvassing special attention for the widows and dependants of fallen members of the nation’s Armed Forces, Governor Rotimi Akeredolu of Ondo State said: “One aspect and perhaps the most significant of the celebration is the need to pay special attention to the welfare of the widows and dependant relatives of the departed ones. On his part, Governor Aminu Tambuwal of Sokoto State pledged increased commitment toward improving the welfare of late, retired and present soldiers in view of their services to the nation. Also, Governor of Osun state, Mr Rauf Aregbesola said: “War is a very bad business. It is costly, deadly and ruinous, even for a supposedly winner. It is worse for the loser. Indeed, all are loser in a war. The resources, human and material, used to prosecute wars could have been used for the development of the people. The lesson of history is that nations and people emerged from wars weakened, devastated, poor and vulnerable. Also commemorating the 2018 Armed Forces Remembrance Day, the All Progressives Congress, APC, lauded the gallant military that fought for the unity and territorial integrity of Nigeria. The post Armed forces remembrance day: Govs, APC call for enhanced military welfare appeared first on Vanguard News.